Taking a pause from our work in Shenzhen and Dafen, we guest lectured and led a workshop for graduate students at the Hong Kong Polytechnic University joint program in Business (MBA) and Design. Much of our recent thinking has considered global cultural communication and integration vis a vis commerce and technology. In China we reflected on its rise as a symbolic and cultural power, and pondered strategies for its future role as global leader. In the lecture we discussed methodologies and approaches to creating and consulting in international environments. It explored geopolitical and social-psychological factors in developing strategies for the cultural globalization of the Chinese Nation. We centered our interactive talk on the suite of commercial and cultural issues that affect and reflect on China’s increasingly real and noticeable participation in global affairs. The lecture reviewed historic and recent Chinese global expansion, activities and influences, including foreign interpretations to them. It also discussed the polyvalency of the emerging Chinese identity and its increasing co-development with the notion of national emergence in the context of industrial upgrading strategies. The workshop asked the students to ponder and propose a strategy and design for a series of global sites and interactions (or elements within them) wherein Chinese business, culture and people would introduce, promote and integrate themselves creatively and responsibly into the world. Fallows, James. “China Makes, The World Takes.” The Atlantic: July/August 2007. Cox, Simon. “Running Fast: Technology in India and China.” The Economist: November 8th, 2007. Gwendolyn is currently honored to be featured in the Smithsonian Cooper-Hewitt National Design Triennal. She’s joined the likes of Apple, Boeing, Santiago Calatrava, Google, NASA and Nike in a comprehensive design retrospective of the years 2003-2006 that is touring the United States. The National Design Triennial seeks out innovative work from across the fields of product design, architecture, furniture, film, graphics, new technologies, animation, science, medicine and fashion. 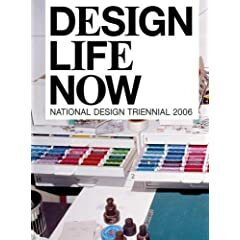 Design Life Now features the work of 87 designers and firms who are leaders, innovators, or emerging figures in the world of design. They are practicing across numerous creative fields, including architecture, products, landscapes, interiors, graphics, film, animation, interactive media, fashion, robotics, and more. The National Design Triennial can now be seen in her hometown of Houston at the Contemporary Arts Museum (link to HCAM). You can also find the full published catalogue here.